meg, paper, scissors: More Cazenovia! You didn't think that was all my pictures from our visit to Caz, did you??? So many beautiful roads. I couldn't get over all the snowy, tree lined country roads. Dazzling. And the ice covered trees! So glittery and magical in the late afternoon sunlight. 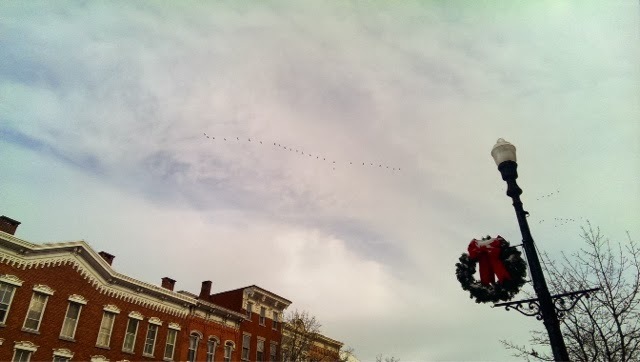 Saw my first REAL Flying V while walking through Cazenovia the day after Thanksgiving. Then spent a quiet morning catching up on small town news at the local coffee shop, Common Grounds. Gorgeous sunset, yes, but those icicles!! I found their abundance fascinating. You can't tell from the photo, but this waterbottle is frozen solid. Because I left it in the car overnight. Second Thanksgiving at Chris' place meant we were spoiled spoiled spoiled and full full full. And what's a family dinner without some good, old fashioned spelunking?